When you delete a shape that is linked to one other shape with a dynamic connector, AutoDelete automatically removes the now superfluous connector. In addition, if you delete a shape that is between two other shapes, Visio will delete one dynamic connector and reconnect the remaining one to both shapes. In this exercise, you will alter a drawing by using AutoAdd and AutoDelete techniques. Navigate to Page-2 if you’re not already there. Drag a Subprocess shape from the stencil and position it on top of any existing dynamic connector. Both ends of the connector display large green squares that are visible through the semitransparent Subprocess shape. Don’t release the mouse button yet. Drop the Subprocess shape on the connector below the Decision shape. Visio pushes the Process shape down to make room for the new shape. Drag a Subprocess shape from the stencil and drop it on the connector between the start/end shape and the first process box. 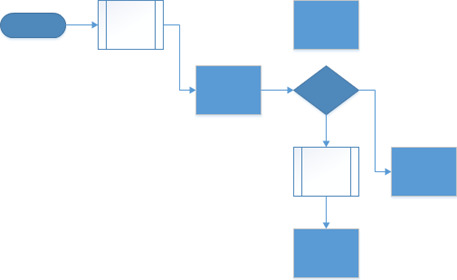 Visio makes more significant changes in order to accommodate the new shape and avoid the unconnected Process shape in the upper right. Select the Process shape at the very bottom of the diagram, and then press the Delete key to remove the shape. Visio deletes the selected shape and also removes the dynamic connector that was linked to the Process shape. Select the Subprocess shape between the Start/End shape and the first Process shape, and then press the Delete key. 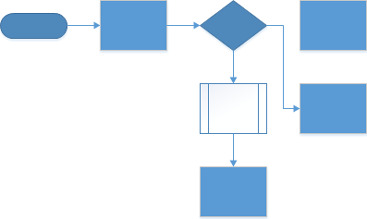 In addition to deleting the Subprocess shape, Visio removes one of the two dynamic connectors and reconnects the remaining one between the Start/End and the Process shapes. CLEAN UP Save your changes to the Quick Draw drawing, and then close it. If you prefer not to have Visio automatically delete connectors when you delete shapes, you can turn this feature off. On the File tab, click Options, and then click Advanced. In the Editing options section, clear the Delete Connectors When Deleting Shapes check box. As you work on a diagram and make both small-scale and large-scale changes, one of your most powerful allies is the Undo feature in Visio. You can undo nearly any action in Visio. The program defaults to providing 20 undo levels, which means you can undo the most recent 20 actions in your diagram. You shouldn’t hesitate to try anything with Visio, because you will be able to undo it if you don’t like the result. If you prefer a larger or smaller number of undo levels, on the File tab, click Options, and then click Advanced, where you will find a setting for Maximum Number Of Undos (the maximum is 99).